Yes. You need to enter just the email domain and cancel the Check Names dialog when it appears. The finished rule will look like the image on the right in Rules Wizard. While this rule trick works in Microsoft Outlook 2010 and up, it's not necessary as Outlook 2010 includes a rule for "specific words in the senders address" which you can use instead. A similar rule exists for 'words in the recipients address'. To apply a rule only to internal Exchange email, create a rule that applies to all mail and add an exception for messages with @ in the sender's address. Internal Exchange email does not use a SMTP address and therefore, does not contain an @ sign. If you don't want to use Exceptions, you can look for /ou in the address instead. If you are using Outlook 2010 and up, you can create a rule "with specific words in the sender's address", highlighted in the red box in the screenshot. Select the condition, click on the underlined words in the lower part of the dialog box then type the domain name you want the rule to apply to. Note: The two items marked with arrows provide alternate ways to do this and are also available in older versions of Outlook. If you want to apply a rule to all mail originating outside of Exchange Server (including Office 365 Exchange Online), use @ in place of the domain name in this rule. Step 1: Begin creating the rule, using the condition "from people or public group". Click in the underlined people or public group at the bottom of the dialog box to open the Rule Address dialog. Type the domain portion of the address in the Address field at the bottom of the dialog. To apply this rule to all email from Internet addresses, enter just an @ sign in the From field. Mail originating on your Exchange server will be skipped. 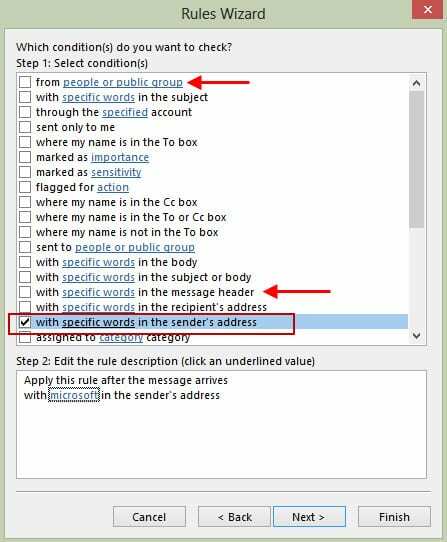 Step 2: Click Ok after entering the domain in the address field, then Cancel the Check Names dialog when it appears. NOTE: the "words in address" rule block seems to create a client-only rule. If *@domain.com or @domain.com work perfectly fine in the "from sender" rule block, I'd say that's a preferred method since it's a server-side rule. Thanks for pointing out the usefulness of the "with specific words in the sender's address" or "recipient's address". Voila! Problem solved. Just wondering if you know of a way to create a rule to move/copy email which are NOT from a specific domain? e.g. I work at New Co. which domain is newco.com. I would like a rule to copy/move all emails which are not internal (i.e. from @newco.com) in order to identify all external emails, which could be direct engagements from clients. If using exchange, move all mail with @ in the address - only mail from internet addresses will have @ in the address. If you want to apply a rule to all mail originating outside of Exchange, use @ in place of the domain name. To apply a rule only to internal email, create a rule that applies to all mail and add an exception for messages with @ in the sender's address. Internal Exchange email does not use a SMTP address and therefore, does not contain an @ sign. For internal Exchange server mail, you can use /ou. Thanks for the tip! I've been getting a bunch of spam from a certain domain and this helped me safely get it out of my Inbox. THANK YOU FOR THIS, I JUST MADE BETTER SPAM RULES THAN JUNO.COM HAS! !